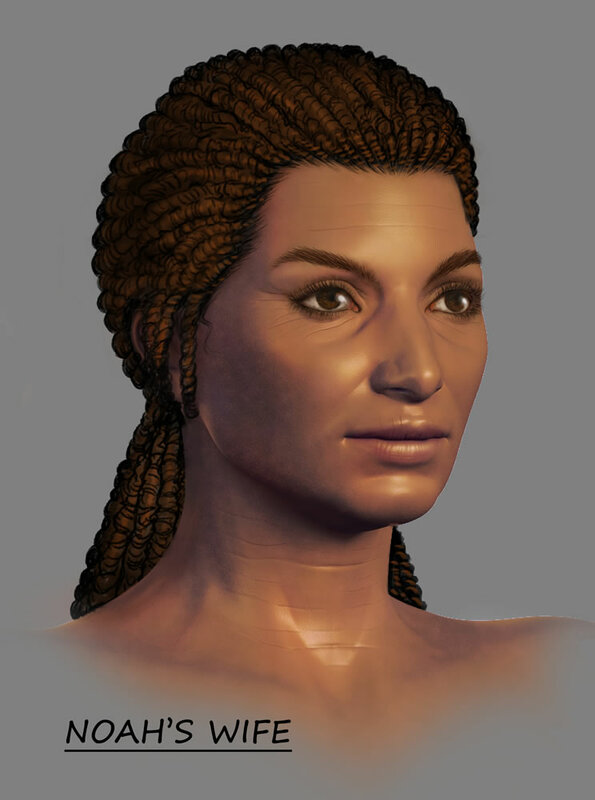 In this series of blog posts, we want to give you a glimpse into the thought process behind how we’ll portray the people on board the Ark. Recently, we gave a sneak peek of some of the concepts for Noah, so this series will focus on the other seven passengers. As explained in the introductory article, we want you to see the rationale behind the decisions we’re making for this one-of-a-kind attraction. Noah’s wife is the great, great, great . . . grandmother to all of us, so her appearance could display a wide range of the attributes we see today. If she were close to the same age as Noah, she would be about 500 years older than her sons and presumably that much older than her daughters-in-law. We have Noah looking like a modern man in his 50s or early 60s, so Noah's wife can look like a woman of the same age, with middle-brown skin, dark hair, and brown eyes. As far as we know, Noah’s wife was the only one of the women who had given birth by the time of the Flood. She could be shown to have some post-pregnancy aspects unlike the other women, although there are certainly many women who return to their pre-childbearing size and build. It’s likely that each of the women was in fairly good shape. Diets of that time were likely not high in sugars and saturated fats like we see today. Plus, they probably maintained an active lifestyle during the Ark-building years. Since they lived closer to the time of Adam and Eve and would have had fewer genetic problems, the women should be depicted as being rather fit.